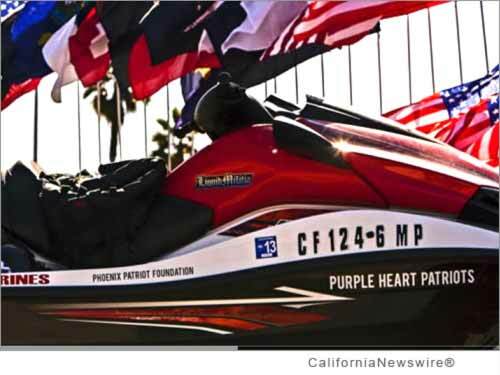 Home CA Armed Forces Teams from all armed service branches to launch personal watercraft in 'Never Quit Challenge' 2014 in Calif. Teams from all armed service branches to launch personal watercraft in 'Never Quit Challenge' 2014 in Calif.
TUSTIN, Calif. /California Newswire/ — It's time for several teams of war-injured military veterans and active servicemen participating in the "Never Quit Challenge" organized by Shawn Alladio to put their personal watercraft into the Pacific Ocean and do what they've always done – finish the job. This time, the job entails something far less dangerous than the harrowing exploits that sent so many of them home to the U.S. for physical rehabilitation. While grueling, the four-day fund-raising run down the California coast from Morro Bay starting next Monday will only severely tire them, not irreparably injure them. But, according to Never Quit Challenge event organizer Shawn Alladio, that's their way of making a very large statement. "Shining a light on the plight of injured service people is part of their process of continuing to contribute," says Alladio. "Most of them are still actively involved in the military in one form or another, but they regularly see others coming back home facing months of rehabilitative work and they see the Never Quit Challenge as making a dual statement." First, she says, it shines a light on the need for the public to recognize individual contributions, and at the same time it points out that these vital social programs are worth "going the distance" for as veterans support the charities. Alladio organized the first Never Quit Challenge in 2013. It was held on the East Coast, with the teams riding from Key West to New York City to coincide with 9/11 commemorative activities. She said more than $100,000 was raised and the team is hopeful that they can exceed that goal this year. The Never Quit Challenge fund-raiser will make stops in Santa Barbara, Ventura, Marina del Rey, Long Beach, Catalina Island, Dana Point, and Oceanside before concluding Sept. 11 in San Diego. * The MARSOC Foundation ( www.MARSOCfoundation.org ). All of the support for the lengthy ocean trip is being provided by volunteers, many from Alladio's K38 Water Safety training team, which works with military, law enforcement, and water rescue operations around the country. Kawasaki Motors Corp., U.S.A. is providing the JET SKI(R) watercraft used by the teams, and Alladio has solicited help from numerous other companies so that virtually all of the funds raised are immediately available to the charities. "That's important for these men," she said. "They want to know that what they're accomplishing next week isn't just pushing them to their own limits. They want to see tangible results that will help others who will have to go through what they've already done." More information on the Second Annual Never Quit Challenge is available at the event's Website – http://www.neverquitchallenge.com – and public, tax deductible donations can be made at https://www.crowdrise.com/2014neverquitchallenge/fundraiser/shawnalladio . Never Quit Challenge Promotional Video: https://youtu.be/0TL4mPy6TR8 .